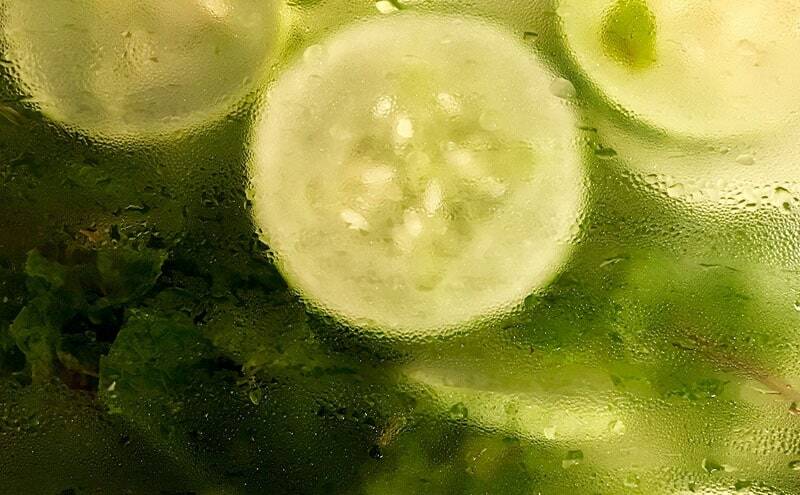 Cucumber is a vine fruit which contains around 96% water, making it ideal for juicing. 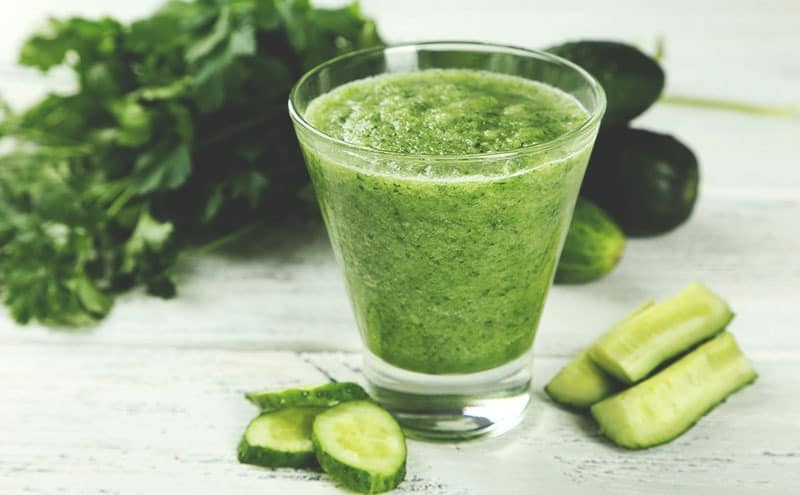 Cucumber juice benefits for health may include antioxidant effects, pain relief, hydration, constipation relief, weight loss and blood sugar control. Cultivated for more than 3000 years, the humble cucumber is thought to originate from India. Used as an essential salad ingredient and in many other recipes, the cucumber is often regarded as a vegetable, but is actually a vine fruit. Yellow and bitter when fully mature, the green cucumbers we eat are in their unripe form. In this article, we discover what cucumbers can do for you as part of your juicing routine and investigate cucumber juice benefits for health. Cucumbers are around 96% water, but also contain soluble fibers including pectin, some carbohydrates and protein, vitamins C, K, B1, B2, B3, B5, B6 and B9 as well as the minerals including calcium, iron, magnesium, manganese, phosphorus, potassium, sodium and zinc. Cucumbers are low in calories – around 16 calories per 100g. Their high water content makes them an ideal source of hydration. So we can see that cucumbers contain a vast array of vitamins, minerals and other nutrients that can potentially have significant health benefits. However, our diets are complex, and hopefully made up of many different food sources. This makes proving the specific benefits of any one fruit or vegetable difficult to prove scientifically. Even so, scientists have been able to prove many cucumber juice benefits for health. Antioxidants are the superheroes that fight harmful free radicals that can cause damage to our cells and lead to numerous diseases like atherosclerosis, some cancers, macular degeneration, some types of arthritis and Alzheimer’s disease. Cucumbers have been found to have pain relieving properties. One study compared the effectiveness of cucumber extract with a non-steroidal anti-inflammatory – diclofenac sodium – which is the active drug in medications such as Voltaren, Cataflam and Zorvolex. While the diclofenac performed best, reducing pain by 75%, cucumber wasn’t far behind, reducing pain by 50%. We aren’t suggesting cucumbers can replace all conventional pain relief, but it may be worth trying the next time you have a headache before popping a pill. Our bodies are made up of around 60% water. A decrease of 2% can cause tiredness and affect brain function; a loss of more than 10% often requires hospitalization. We need water for every single metabolic function of our bodies, from maintaining our internal temperature to transporting nutrients into cells and removing waste products and toxins. Given the high water and fiber content in cucumbers, it’s not surprising that cucumbers can help to reduce constipation. Pectin, the type of fiber in cucumbers, has been studied and found to considerably increase the speed at which the colon works, alleviating constipation. Cucumbers can potentially aid weight loss in a number of different ways. Due to their low calorie content, regularly including cucumbers in your diet can help to fill you up, reducing the amount of other higher calorie foods we might choose to eat instead. Cucumbers, in addition to other vegetables, can help to make a tasty, refreshing salad which can provide a satisfying meal for lunch or dinner. Cucumbers are a convenient food to eat as a snack. Other than washing the skin, cucumbers don’t require much preparation, so getting into the habit of snacking on cucumbers can make a healthy fast food alternative to junk food. Medically speaking, cucumbers are generally safe to eat. However, they are one type of fresh produce which can contain high levels of pesticides, and can be waxed. All fresh produce should be thoroughly washed under running water and dried with a clean paper towel before juicing. It’s best to give cucumbers an extra firm scrub before use, and juice them using a masticating juicer which can remove some of the chemicals. For the best possible nutritional value in your juice and the lowest amount of pesticides and wax, consider using organic cucumbers. Juicing is an ideal way to include cucumbers in your diet. A good quality juicer can extract many of the healthy substances that cucumbers have to offer, and cucumber juice adds a cool, mild, refreshing flavor to juices. Cucumber combines very well with flavors like mint and lemon, and can help to balance the high sugar content of fruit when juicing. 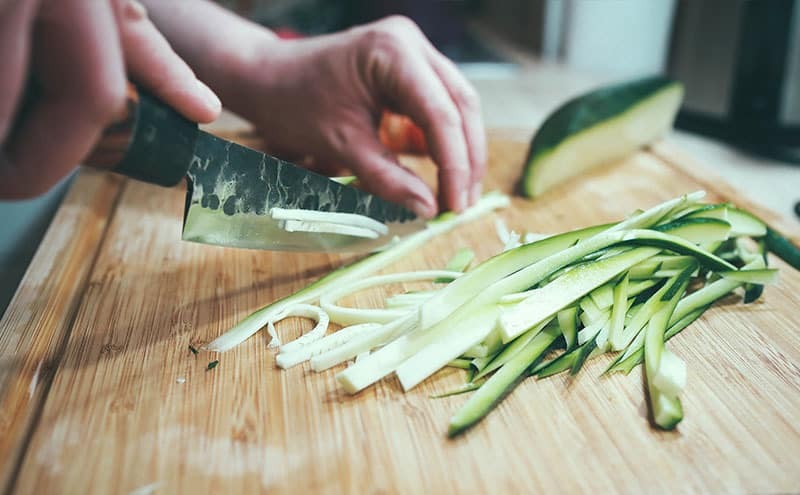 The best way to juice cucumbers is to slice them lengthways without removing the skin, into pieces your juicer can handle. Here are some of our favorite cucumber juicing recipes. This juice is a great way to start the day. Not only is it cool and refreshing, it also helps to promote healthy hair and skin, as well as boosting the immune system. This beautifully colored juice is great at any time of day. It contains large amounts of antioxidants, helps eye, skin and hair health, boosts the immune system and tastes great! If desired, serve over crushed ice for a delicious juice that packs a great health punch! This juice combines cucumber with strawberries and watermelon to give a cool, refreshing juice that’s full of hydrating antioxidant power. The mint adds a nice zingy twist! This juice mixes cucumber with apple, lemon and cilantro to cleanse, refresh and detoxify. This juice is a powerhouse of essential vitamins and minerals, as well as being rich in antioxidants.